Next review Bookvip - Not happy! First and foremost, I would like to apologize for any inconvenience and stress resulting from the transportation issues you encountered during your vacation and for the lack of communication provided to you. The Resort is responsible for arranging for the guest’s transportation from the airport and communicating with the guest. 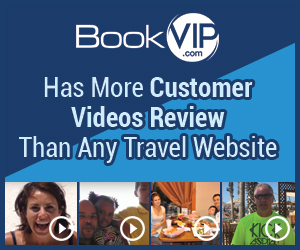 As the booking company, BookVIP has no control over that aspect of the vacation package but will certainly address the issue with the participating resort provider. We booked a 4 night stay at silver sand secrets resort. The advertised rate is not what you pay. After booking you are taxed with a couple hundred in fees but still a pretty reasonable deal. I had a couple follow up phone calls to confirm my travel plans. One question was about the ride from the airport and it was confirmed that someone would have a sign with my name outside. When we arrived there were tons of people with signs and I never found my name so we just took a taxi that was an additional $70. The resort was very nice good food and drink and the all inclusive was a great deal. The time share part was pretty close to the 90 min maybe 120 and was a lot of sales pressure but I just had to stay strong and say no. On the day we left they scheduled a ride to the airport and verbally told me to be in the lobby 2 hours before my flight. When were went to the lobby they said our ride had left and we should have been down earlier. They said there was nothing they could do about it and we had to pay another $70 to get to the airport. After I returned home I found an email in my junk folder with the ride vouchers that the hotel asked my about. I had no idea these came and I with the confirmation calls would have asked my if we had them. They kept telling me I didn't need anything. Overall the trip was great. Don't think I will book through VIP again. I found other deals that I felt we just as good and i will try them next time. Reason of review: Taxi Service/communication. I liked: Pretty easy to use, Resort was very nice. I didn't like: Phone communication was poor due to english barrier. Review #879938 is a subjective opinion of Holly20162016.